Christmas was my favorite holiday when I was a kid. It meant new toys and a visit from Santa. I would pour over the Sears catalog and make a long list of things I wanted Santa to bring. Our mom would go shopping for hours. I'd ask my dad, "Where's Mama?" He'd say, "Gone shopping." I couldn't wait for her to come home so I could ask her what she'd bought. Not that she would have told me. She'd come home with mysterious bags and packages and hide them away from us. We found one of her hiding places. Once in a while, she lost a present, but she'd find it by chance a while later. Three generations together for Christmas 1954. 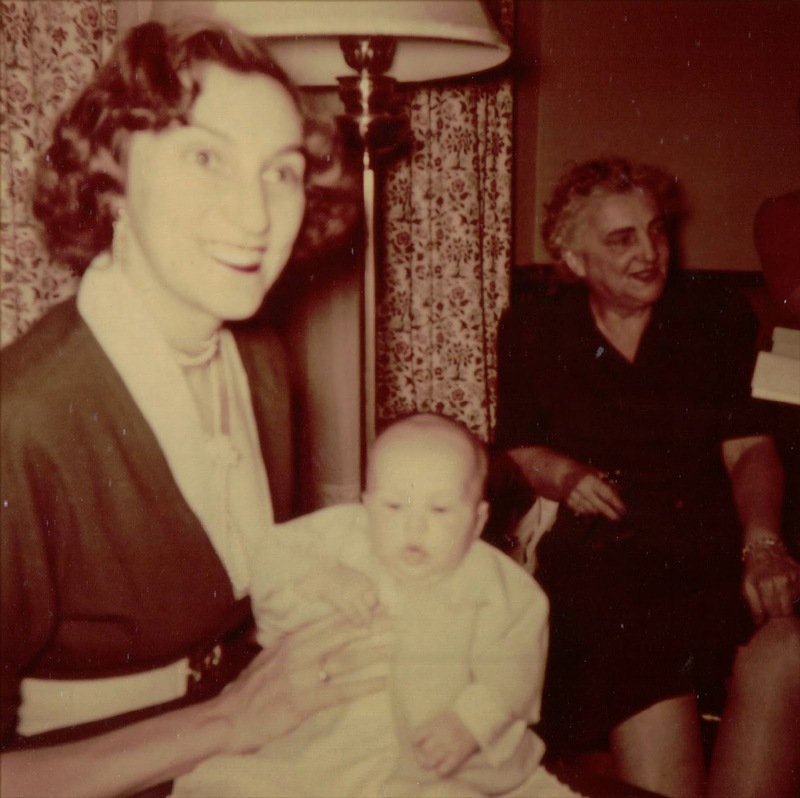 My mother, me, and my grandmother Leona Roberts (Redles) at my first Christmas. This was taken at the J.T. Roberts house. and Christmas stockings hanging on the mantle. This was probably in the late 1950s, maybe before John was born. The two stockings on the left are my parents' and the two on the right are mine and Andy's. John would have had one like ours. The three in the middle are probably decoration. On Christmas Eve, we'd get together with my dad's side of the family and exchange presents. We had a tough time going to sleep on Christmas Eve. Our parents would tell us Santa couldn't come unless we were asleep, but we were too excited! We'd wake up very early the next morning to see what Santa brought us. I remember getting up one time at 4 am! 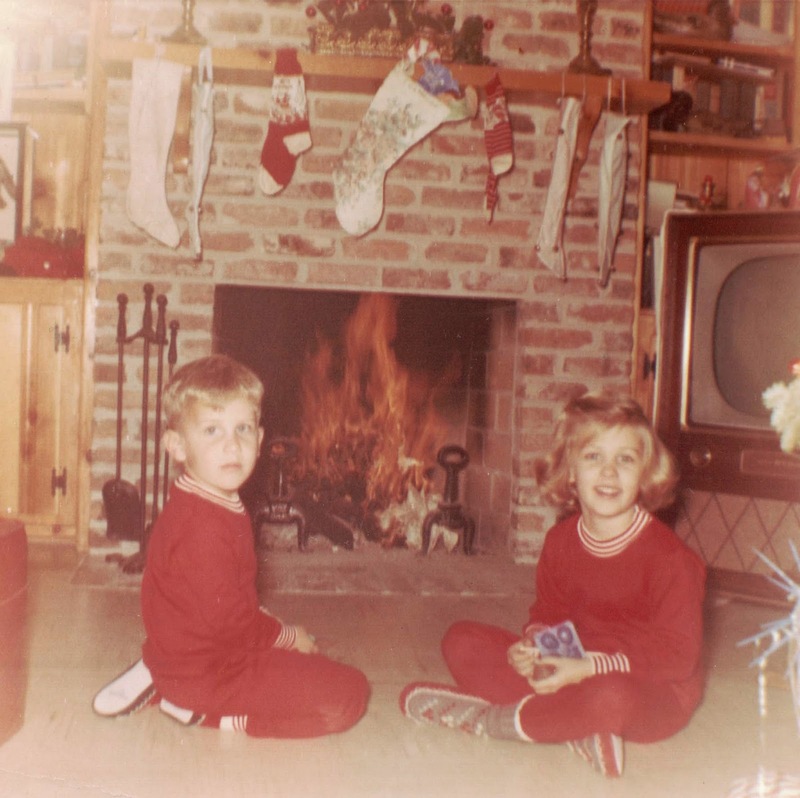 One rule our parents had was we could not wake them up Christmas morning, because we got up too early! They probably heard our squeals of delight even though we'd shut the door to the den and tried to be quiet. On Christmas Day, we'd go have dinner and exchange presents with my mom's side of the family at the J.T. Roberts house. I hated being torn away from my new toys. I'd usually take at least one with me. Oh, to be a kid again and feel that same excitement!